I love pancakes. They are one of my favorite breakfast foods, and my son begs for me to make them nearly every Saturday morning. We also eat them for dinner a lot, especially when 6 o’clock rolls around and I realize that I have nothing to cook! I tell ya what though, no one ever complains when I say I’m going to whip up a batch of pancakes! One of my favorite kinds of pancakes to make are Greek Yogurt Pancakes. Not only are they delicious, but they are chock FULL of protein! This is a huge deal to me for a couple of reasons, one of them being that getting my daughter to eat any kind of meat is seriously like pulling teeth. The struggle is very real and we deal with it on a daily basis! I worry about her getting enough protein, so I try to make sure that she gets it in other ways, and thankfully she LOVES Greek Yogurt. 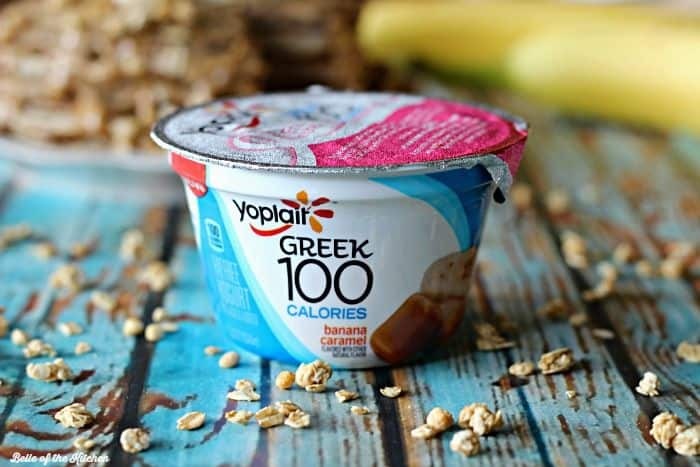 We always buy a variety of flavors from Yoplait, and recently discovered their Banana Caramel Greek 100 Yogurt at Walmart. 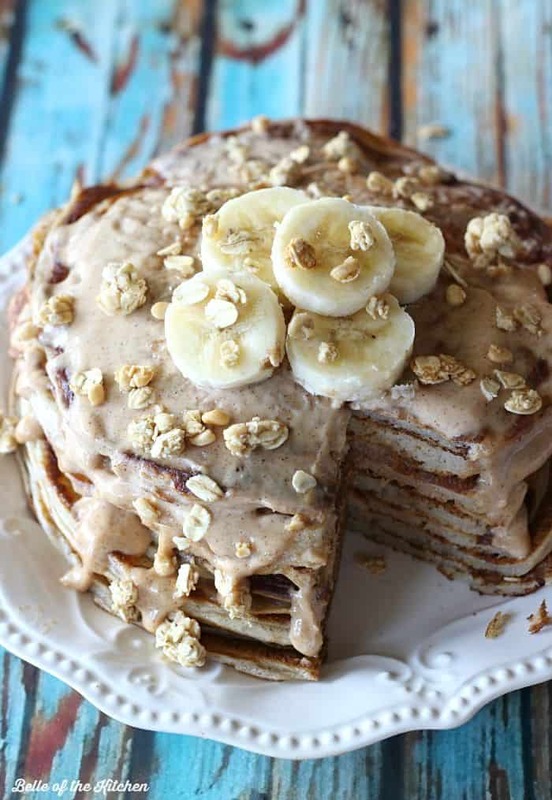 The Banana Caramel flavor is so delicious, it’s almost like eating dessert, but a healthy one! 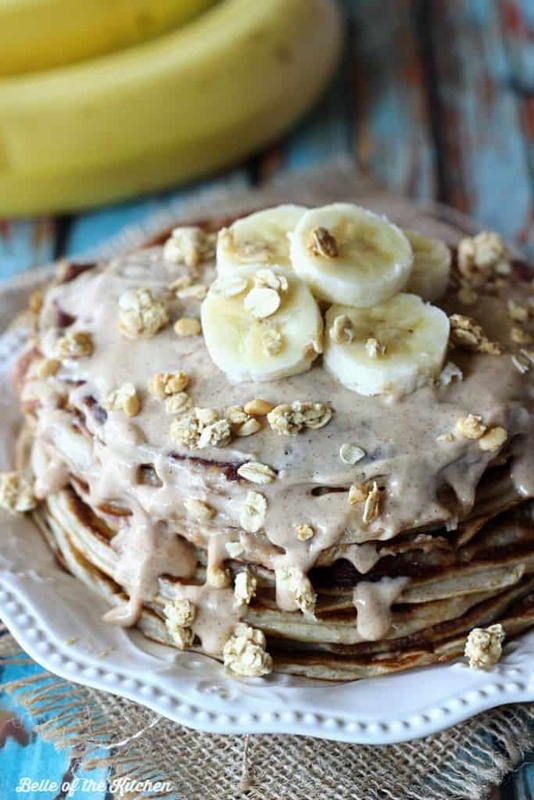 I love eating it by itself with a little scoop of granola on top as yummy snack, so I knew it was going to be perfect in pancakes! My kids love these pancakes and I feel good about them eating them since they are getting a good healthy start to their day. We also eat a good bit of almond butter at our house (we are peanut-free due to my son’s allergy) so I decided to add some of that to the mix this time. The almond butter adds even more protein and flavor, especially if you use an almond butter blend. I used a homemade cinnamon almond butter for this, but you could use whatever nut butter you prefer. I also made a little almond butter yogurt glaze to spread on top in place of syrup, then added on some sliced bananas and a sprinkle of yogurt for some extra crunch. Delish! 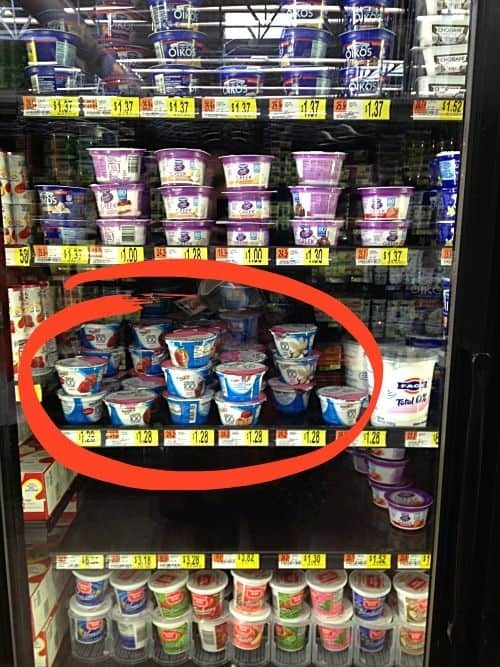 To get your hands on some of this yummy Yoplait Greek 100 Yogurt, just visit your local Walmart store. 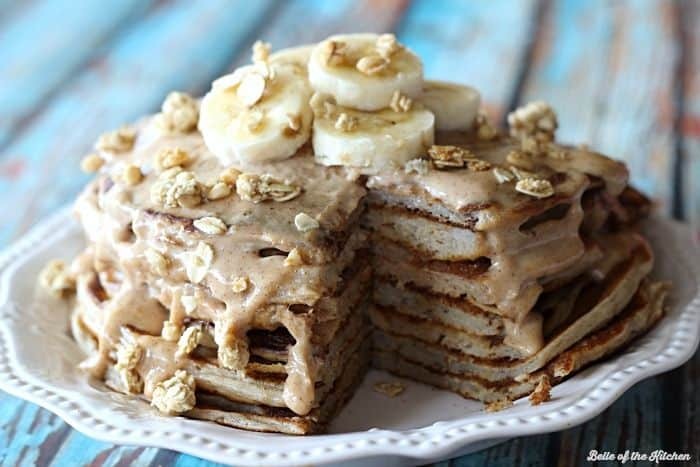 Greek yogurt almond butter pancakes packed with protein and topped with an almond butter yogurt glaze. The perfect way to start your day! In a small bowl, spoon out 1 TB of the yogurt. Add in 1 TB almond butter and 2 tsp milk and whisk to combine. Set aside. In a separate medium-sized bowl, whisk the remaining yogurt with the egg. Stir in the flour and baking soda until well combined. Finally stir in the mashed banana. 1-2 TB almond butter, and 1/4 cup milk. Heat a large skillet on the stove to medium heat, or turn an electric griddle to 350 degrees. Melt a little butter in the skillet or on the griddle and scoop batter on top into desired sizes. Once tops start to bubble, flip and cook until both sides are cooked through. 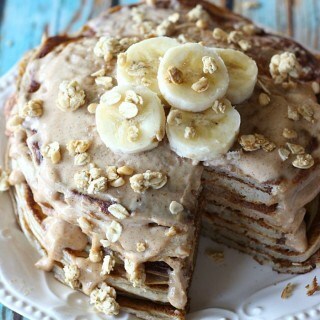 Top with almond butter yogurt glaze or maple syrup and enjoy!